Tag Archive | "cross country"
BIIF 2009 Cross Country Championships at Kamehameha-Hawaii Campus Boys Open Division Results Boys Varsity Division Results Girls Open Division Results Girls Varsity Division Results The Hawaii High School Athletic Association cross country state championships will be held Saturday (Oct 31) at Island School on Kauai. The University of Hawaii at Hilo claimed second place at the Brigham Young University-Hawaii Men’s 8k Invitational on the Laie, Hawaii campus course. Stefano Barbis led the Vulcans with a second-place finish in a time of 25:50.Kirsta Andrew finished fourth at the Brigham Young University-Hawaii 5K Women’s Invitational on the Laie, Hawaii campus course. 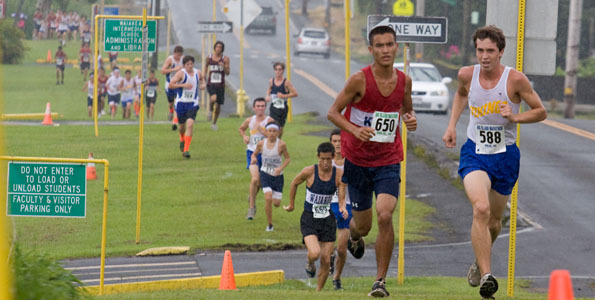 Runners head up Puainako Street during the BIIF cross country meet at Waiakea High School. The University of Hawaii at Hilo settled for a fourth place finish at the University of Hawaii Big Wave Invitational held on the Kaneohe Marine Corp Air Station on Oahu. Stefano Barbis Rochabrun’s third place finish led the University of Hawaii at Hilo to a third place finish at the University of Hawaii Big Wave Invitational held on the Kaneohe Marine Corp Air Station on Oahu.